Joel's Jottings: Did Titanic's passengers eat Oreos? When she saw the 100th anniversary special OREO biscuit packets, in one of Bahrain’s supermarkets, my ten year daughter exclaimed excitedly, “Wow, the people on the Titanic must have tasted Oreo biscuits”! She remembered that it was also the 100th anniversary of the sinking of Titanic. And connected the events! I beamed proudly at her, appreciating her general awareness and her deductive logic, wholly attributable – of course - to her parentage, from father’s side. Even, if her mother disagrees. So, smugly accepting the view of our 10 year old, I assured her that the Titanic’s passengers perhaps did. But, it had got me thinking. As I now know that Oreo biscuits were made first in 1912, and since I already knew that RMS Titanic sank on the night between 14-15 April 1912, if my daughter’s logic has to be proved correct, the passengers of the ship should have had access to the biscuits before they started their journey. But, there was a problem. I was not sure of the exact day when Oreo biscuits began selling. What if Oreo biscuits were produced and sold after April 14 that year? In that case, we will have to definitely conclude that passengers onboard the ship did not taste them before they started the journey. So, I did some scientific research into this. And, guess what? I discovered the exact date. 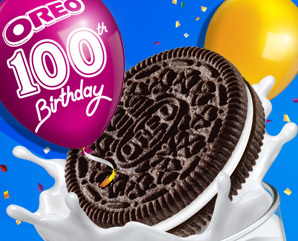 ‘On March 6, 2012, Oreo turned 100 years young’ boasts the Nabisco website. ‘The first Oreo cookie was sold on March 6, 1912 in Hoboken, New Jersey’ says the Kraft Foods website. So, it’s official then. Oreos were being made more than a month before the ship set sail. And I even found out from Wikipedia that the place where they began making Oreos in 1912 was in Nabisco’s Chelsea factory in 'New York City'. But the ship RMS Titanic which had set sail on 10 April 1912, started from Southampton, UK towards New York City, USA. Not the other way round. Which means the biscuits should have been ‘exported’ from NY, USA across the Atlantic, to reach UK, within a month, before April 10, so that anyone travelling got a taste. That is highly improbable, given the long travelling time, and the lack of information. So, elementary my dear friends, the passengers of Titanic could not have tasted Oreos before they started. But, yes, there is one possibility. We cannot rule out this one thing. 713 passengers are said to have survived. Many of them settled in the USA. So, it is very much possible that some of the surviving passengers may have tasted these biscuits afterwards. My daughter’s logic could be right in a way. Will Missile Makers Make Peace?